Finishing up my series of 5 Common Money Mistakes, I’d like to talk about something that many of us have done: fallen for a scam. Scams come in all flavors. 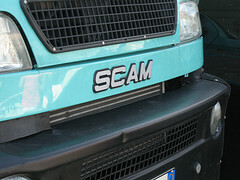 New Zealand’s Consumer Affairs Department posted a great quick list of types of scams. You have phishing, multi-level marketing (MLM), work from home, identity theft, astrologist/psychic, and many others. Oh, and don’t forget the oft-cited “Nigerian Letter” scam, also known as an “Advanced Fee Fraud“. As a society, we’ll never get rid of scam artists and scam victims. There will always be people not content with 9-5 jobs and a regular paycheck. Or they might just want a little extra cash on the side. Or, they may just long for the challenge, and scamming just makes them feel superior. And then there are those people who are easy prey. They’re people who are intelligent, want an easier life, and/or lack the knowledge or energy to protect themselves from predatory individuals. They’re people like me, when I was younger, and even when I was older. They are people like your grandmother, sister, father, coworker, neighbor, or even you. No one is exempt from falling for a lie. When you’re “getting taken”, you justify what you’re doing. You’re “building your own business” or “getting into the next big thing before it becomes big“. You may also be “helping someone get out of a bind” or “investing in a sure thing“. I’m going to outline a few personal stories where I fell for a scam. I’ve held off writing this article because I knew it meant confessing to the world about my stupidity. However, scam is a harsh word. For the purpose of this article, I’m defining a scam as “a promise of riches with minimal work“. When I was about 15 years old, I was promised riches if I set up my own mass-mailing system. All I needed to do was order a bunch of materials (pre-formatted letters and address labels). If I recall correctly, the materials cost me about $40. In 199x, and for a kid with only a couple paper routes, this was a sizable chunk of change. Basically, it was a pyramid scheme where I sent some money to names on a list, then added my name and mailed it out to people. Obviously I didn’t get any responses. Why did I fall for this? In this instance, my best friend was one of those 5 people on the list, and claimed that he had already started to receive envelopes of money. I never found out whether he was telling the truth or not, but I quit that activity pretty quickly. But this brings to question “How can you know whether you just need to work harder versus giving up and calling it a scam?”. I don’t know the answer myself. If I just tried a different address list, would I have been successful on the envelope pyramid? I’ll never know. But this question leads to my next experience. Fast forward about 13 years to 2006. I’m completing some offers for a free plasma tv, and the last choice of offers is to get a starter pack for “Winning in the Cash Flow Business” for $95. It was a 90 day trial, so I went ahead and bought it, thinking that I would just get the refund in a month when the transaction cleared. Now you’ve probably seen ads for these types of money making systems. However, you probably can’t find out what the scheme really is until you order the packet. It’s also very similar to TV infomercials where the salesman keeps telling you about this proven method of making money in real estate with “no money down!”. To cut to the chase, this business is America’s Note Network (ANN for short), owned and operated by Russ Dalbey. The Note Network is a listing mechanism for real estate notes (aka promissory notes or mortgages). If you have a loan on your house, the lender has a promissory note on your property. You usually think of the lender as a bank, but many times it is the prior owner of the property. These are “For Sale By Owner” properties where the owner either owns the property outright and collects your payments with interest (like a bank), or still has his own mortgage on the property. In that case, you pay him, and he pays the bank. So now that you know about “Notes”, how is this a scam? The actual business of buying and selling (and finding) notes is not a scam. It’s a real-life market. The scam is the “extras” that ANN offers as a sure-fire path to riches. Let me illustrate with my confession: I spent $1,500 for “advanced training” and a “seller list”. It could have been worse. They wanted $4,000 at first, but that came with a “weekend on-site in Colorado with your very own master seller”. That weekend didn’t include airfare or lodging. Or much of anything else from what I could tell. I talked them down in price, then cut out the needless things. But here’s where they get you. They call YOU, and tell you the offer is only good for that day. You’re pressured into making a decision without the full information or a cooling-off period. Before making the purchase, I talked with my wife. I truly felt that this expenditure would get me the footing I needed for my new business in notes. She trusted my decision and said OK (apprehensively of course). The online training was good, but nothing I couldn’t have learned on my own through library resources and the internet. It was basically how to price notes and some sales techniques. It was not worth $1,500! Additionally, the seller list was just names and addresses of people who MAY have notes based on public record. It was MY job to actually look up their phone number. I spent hours looking up 300 numbers, and in the end, only 1 of those 300 even HAD a note! It definitely was not as easy as they claimed it to be. So what has become of my note business? The documents and books are collecting dust in a filing cabinet while I still kick myself for throwing away all that money. What I should have recognized up front is this: I am not a salesman. Why would I have thought this business plan was for me? I have no idea. I was pressured by better salesmen, and I made a dumb decision. Oh, and after I signed up, I kept getting emails to join this same program. Looks like it wasn’t a one-time deal. So what have these experiences taught me? Before any other thought commences, listen to your conscience. As you age, you’re becoming a trained lie-detector. Listen to your gut and don’t try to reason your way into an answer opposite of your gut. Research, Wait, Repeat– Find out what others say about this product, service or idea. Use all resources, but always take word of mouth with a grain of salt. Don’t believe testimonials. You’ve seen the news stories about paid testimonial actors, right? And when would a business ever give a bad comment about their product? I plan to provide some other stories from friends and family about scams they’ve fallen for, but until then, let me hear your story? What have you fallen for? How much did you waste/lose? Were you the conscience of a friend or family member, but they just wouldn’t listen to you? This kind of thing is where my inner skeptic really earns its keep. I find that I naturally don’t believe anything like that and it works out really well. I’m sorry you had to find out the more expensive way. And yes, the offer is never only good for that one day. I’m pretty sure that when I was 15, I got one of your letters, and then proceeded to send them out on my own. I did recoup my costs though, but I wasn’t able to get the sports car that I was hoping for. I definitely agree with Clever Dude’s summary lesson. It is often that he’s eager to make a purchase (our 3 car issue for example) and I’m the one who says “let’s sleep on it”, or “let’s wait 6 months and see where we are financially”. Of course, there are MANY times when I’m called to make a decision and I will choose just to not make one because I’m feeling pressured (so that’s not a good thing). But in summary, I agree with his summary lesson!! It’s good advice!!! I almost got scammed once on Ebay. It all seemed legit. What happened was a guy wired me money, about $2000 worth. It showed up in my Paypal account, it looked legit, I started transferring it out. In return, I had to wire back $1500 to him (I forget what his reasoning was, I was really young, like 19 I think), and I’d get to keep the $2000, the $500 as a bonus for helping him out. This had to be done within a 48 hour time period or something… So I went to the bank THAT VERY DAY to buy a money order to wire that $1500 to him, but by a stroke of luck and a bit of stupidity, I had forgotten his address on a slip of paper at home. It was a good thing I did, because by the next day, when I went to go check on my Paypal account, they had revoked that $2000 and said the money had been transferred in error. I emailed them right away, explained the situation and the scam, and felt intensely relieved that I didn’t fall for it. The promise of free money really warps your sense of sound reasoning. P.S. It had to be a money order because it’s just as good as money….